Self Fusing to create strong, watertight seals around all kinds of pipes and surfaces. Self levelling triangular construction for a smooth surface finish. High temperature resistance and able to be used outdoors. Self Levelling Silicone Self Fusing Tape is a special type of self-amalgamating tape that can be used to create watertight, impenetrable seals around pipes and other objects. This special type of tape is manufactured in the USA and has a triangular cross section which causes it to create a smooth outer finish which reduces bulk and the likelihood of it catching on other objects. 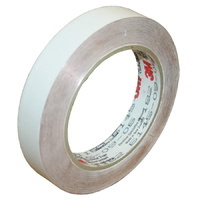 This high quality sealing tape is made from a special form of cured self fusing rubber that will stick only to itself. It’s non-tacky to the touch and comes with an easy to remove liner to prevent bonding while it’s still on the roll. It stretches well and is very conformable so it can be applied neatly around irregular shaped objects like cable connections and junctions. Our Silicone Self Fusing Tape will withstand temperatures between -54°C and +260°C, has excellent dielectric strength and bonds to itself in 24 hours. Each roll is also supplied with a green centreline to make application simple and easy. Sealing or leaking pipes and connections. Protection of cables and wires. Insulation of leads, cables and piping. Insulating cable joints and terminations. Protection of motor coils from vibration. Insulation of heated transfer lines. This depends a little on what you’re applying it to. Assuming it’s a bit of pipe or a cable, it’s really simple. Start wrapping at an angle of about 45°C. This is easy thanks to the centreline as all you need to do is line that green centreline up with the outer edge of the previous wrap (which ensures 50% cross-over taping). From there, it’s a question of how large the area is and how many layers you’d like to put down. Obviously, the more layers the higher the insulation (both thermal and electrical) and the greater the protection. Of course, this will also use more tape and create more bulk so it does vary depending on what you’re trying to achieve and the space available. Will this stick to other things? No. Self Levelling Silicone Self Fusing Tape is designed to only stick to itself. To prevent unwanted premature adhesion each roll is supplied with an easy to remove liner that should be taken off as you apply the tape. Not of this particular tape. We do offer other self-fusing tapes (both silicone and rubber) which are available in other colours but for now, our Self Levelling Silicone Self Fusing Tape is just available in red. We’ll be sure to update this answer the moment this changes. Do I need to use the whole roll? Not at all. Just use the amount you need. Just be sure to not remove the liner from more than you’re using as any tape left on a roll without it’s liner will bond to surrounding layers. For more technical information please see the Technical Data Sheet for our Silicone Self Levelling Self Fusing Tape located on the media tab.